Drum Recording - Start with GREAT drum sound! The foundation of a great recording starts with GREAT drum sound! The industry has changed – many more people are choosing to dive in and record themselves, which is awesome – home recording can achieve so much, but there is still no substitute for a perfectly tuned drum kit in a great sounding, large, spacious room. And this is where home recordings most often fall very short of the mark. Trust me, once your drums sound great, everything else is easy! 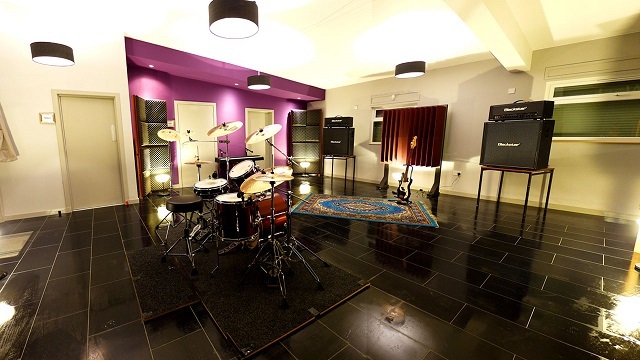 For only £12 p.h – a tiny amount more than it would cost you to rent a rehearsal room and do it yourself – you can walk in and with minimal of fuss, record your drum tracks in our huge room then take the files away with you. Check out the sample below of just how good our room sounds. A single pair of mics in a Blumlein configuration over a beautiful Pre-1973 all maple Ludwig kit. Stunning.